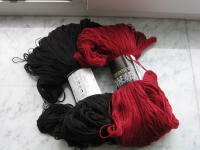 So, the promissed pictures, of the yarn purchases and some other stuff! 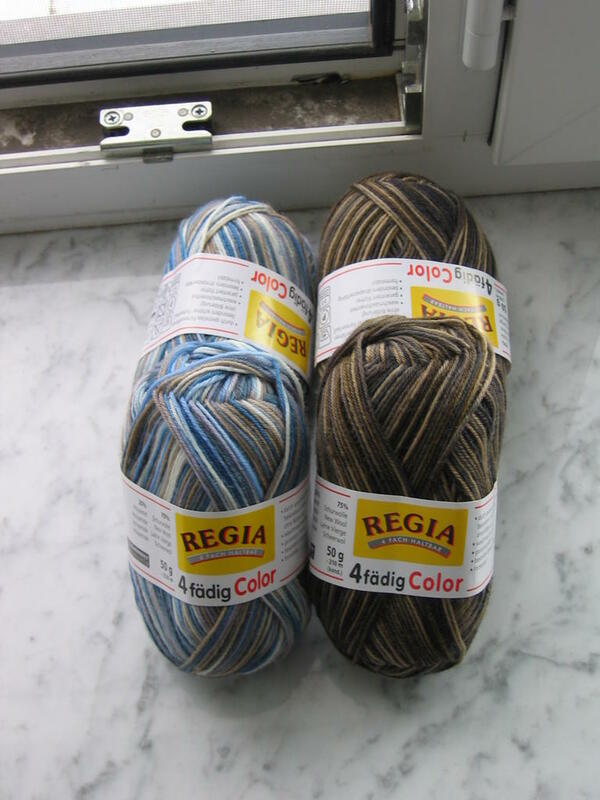 First up, the yarn I got in Italy! 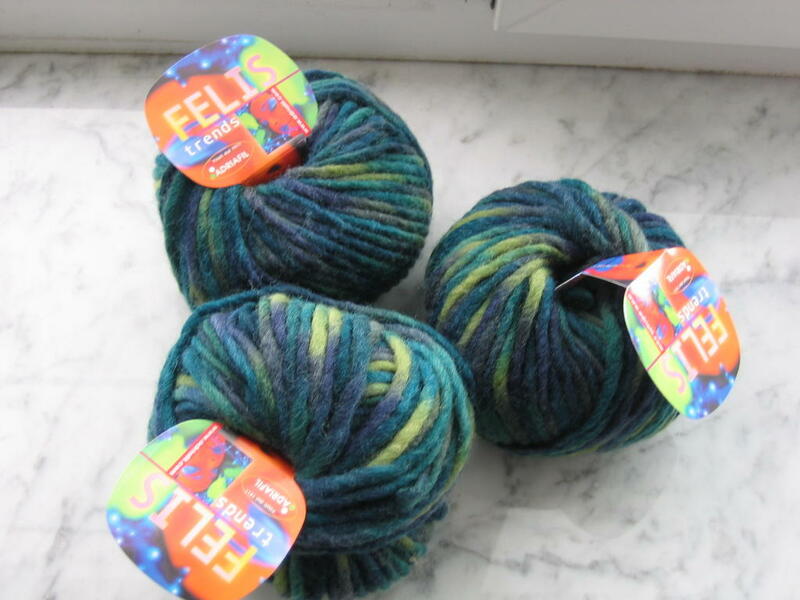 - 100% wool, handwash so probably great for felting! The blue stuff is going to my SP5. I have 2 balls of each colour. 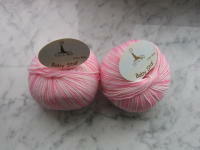 - 100% cashmere, 2 balls, perfect for a scarf I think! 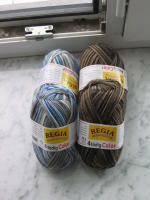 - 40% cashmere, 30% silk, 30% wool, super laceweight, scarfs in the future! And of course it's all Made in Italy! I was in love with the stuff this yarn shop was having, to bad I couldn't buy more. but it was already way over 100€ and boyfriend payed for me, so I should shut up and enjoy it! 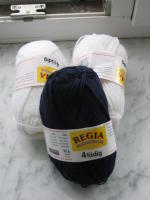 - Regia 4Ply solids. 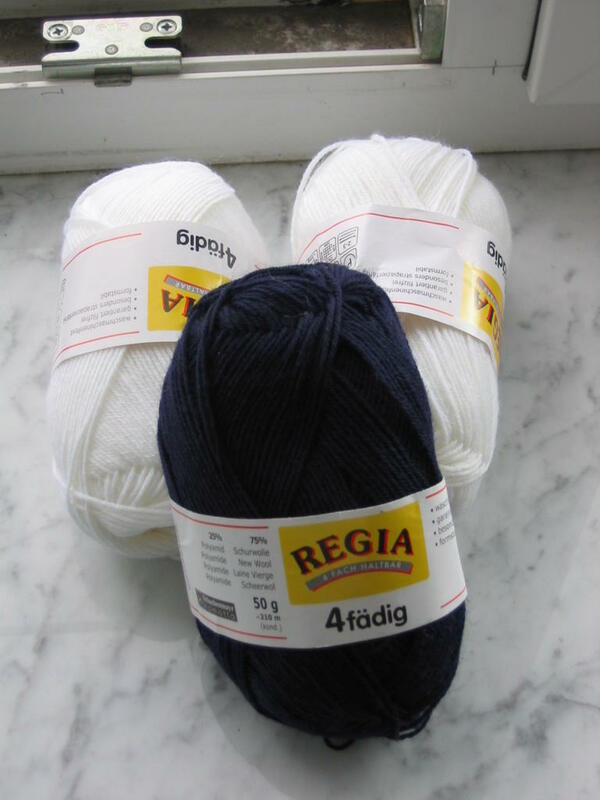 No project for the white, but there are actually 2 of the blue and they will turn into the new 6socksKAL. - 100% wool, supposed to be handwash, hope it felts!! Next up, the 2 socks I finished. These are my stashbuster stripes socks! Well, one that is! :D I'm enjoying this pattern so much! 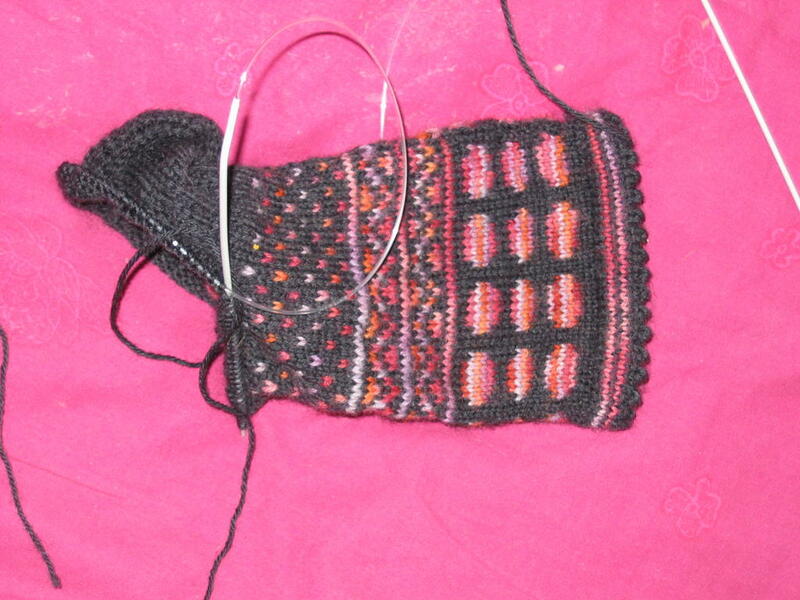 I casted on for the second sock and will have a blast. As you can see I casted on to many stitches, 80. I decreased before the ancle and got at a total of 68. 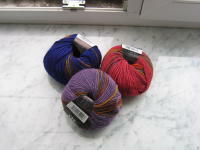 They are on 2.0mm needles, with Arnell sock yarn (local yarn, easy and cheap to get). I like me heels and toes in the same colour. I used black, pink and egg plant/burgundary. It's amazing how nice they fit. I put all my balls in center pull balls which makes it a lot easier. 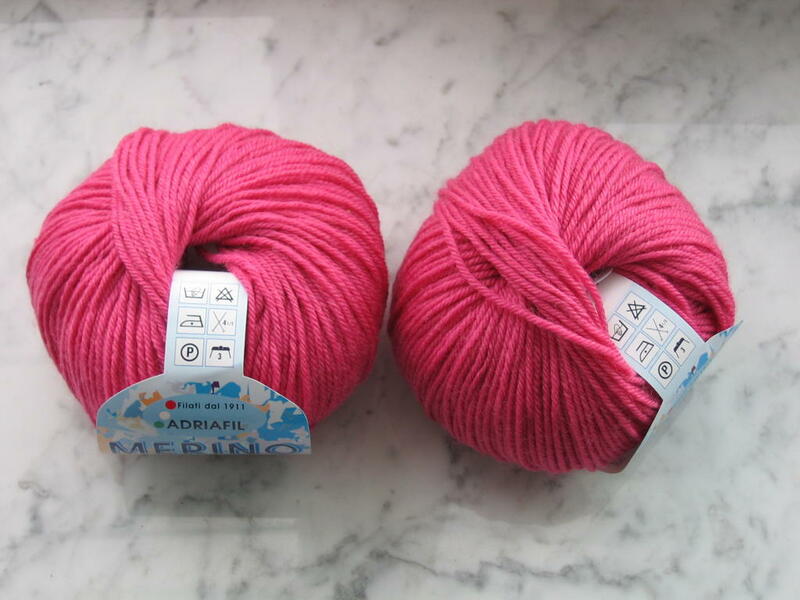 Then I put them in the same order in front of me every time I knit and I just move the balls as I use the colour, which avoids tangling. Really neat, more socks like this planned (I like striped socks! :D). 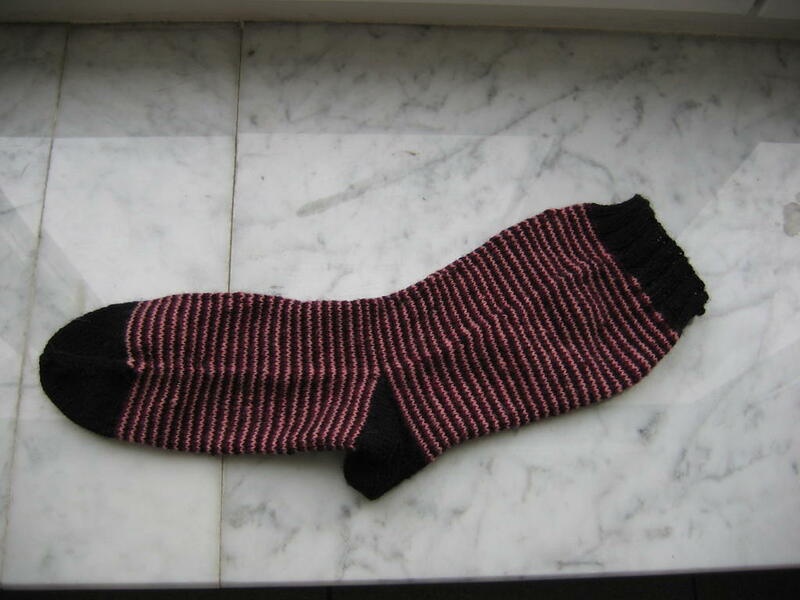 This is the first sock of the Friday Harbor socks from the Knitting on the Road book. I finished that one in the car on our way back from Italy, but I didn't cast on for the second one yet. Will do shortly. Used 2.5mm socks, Sockotta sock yarn (should look for the lable). I'm finding out I don't really like Fortissima that much, but they are looking okay. Might have done better going for another colour, but still, I like them and I didn't have any solids or so with me at the trip. 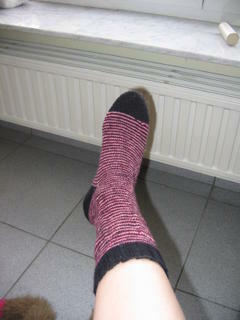 Now I forgot to take pictures of the finished socks of boyfriend. Finished them while in Italy and they turned out really nice. Picture and more detailes soon. Don't get me wrong, I LOVE this sock and how it turned out, but it's just to small. And I don't see myself wearing socks to small. 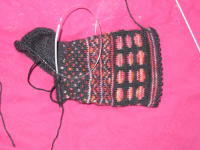 It was my first try-out with FairIsle, and turns out I'll need to cast on more stitches in the future. 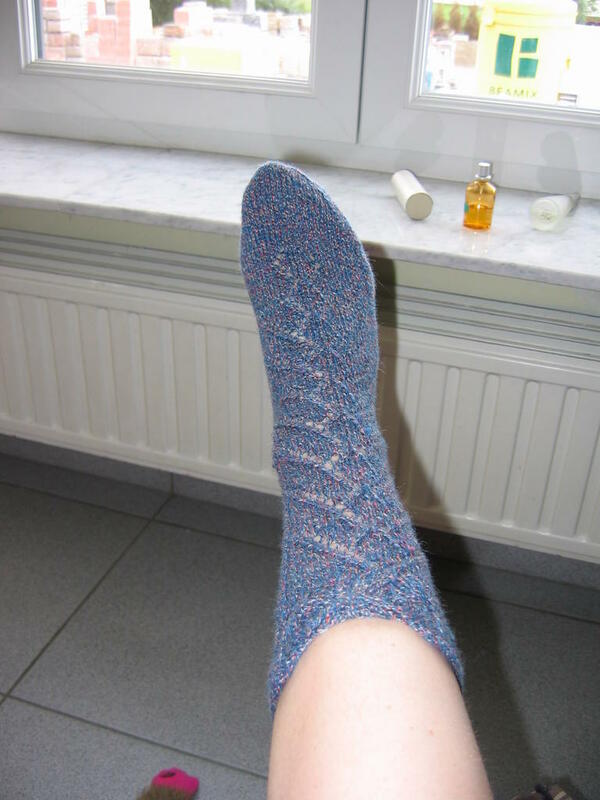 I will start them over with the same pattern though, just adding 8 more stitches. 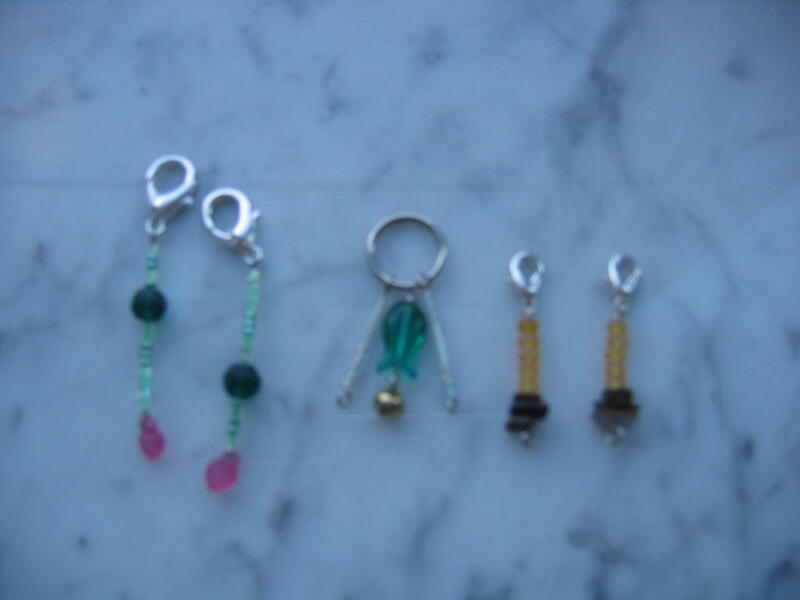 And I make some stitch markers for my secret pal of the Stitch Marker Swap. They should have gone out Friday, I'll just send them by priority, shouldn't take them to long. They look ok, though I can do better I guess. Hope my pal will like them. I'm adding one more just for the lateness. 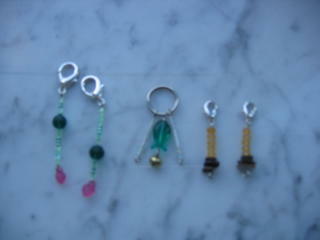 And then, for Sandra, a little sneek peak of the package that will be going out tomorrow! It's all acrylic, some is new, just bought it on Friday. I hope you'll like everything! There's also a package going out to my Secret Pal. I now found out I just bought to much stuff for her! I'll put some of it up for swapping/selling over here, as I don't like it for myself! Soon, not now though. Off to do some knitting! I wish I were you due to the yarns! What a lovelly coloures! Can't wait to see what will come out of it! by the way, those yarns are so pretty!! !